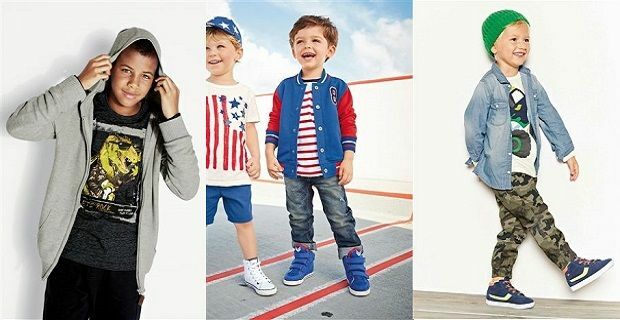 When it comes to good value but good quality children’s clothes you can’t go too far wrong with high street favourite NEXT. For Spring 2014 they have provided comprehensive collections for both girls and boys of all ages. Having already taken a look at the girls collection we look at the boys range for the upcoming Spring season 2014. Starting with the baby boy from newborn to 18 months NEXT provides a full range of baby clothes including onesies and packs of vests in their Sweet Dreams range which are emblazoned with boyish lions and cars. The Indigo collection for the baby boy features denim trousers and shirts, padded gilets and jackets as well as dungarees, stripped long t-shirts and cute tops with quirky prints and text. The Spring Brights range for the young boys and Spring Break range for the older boys brings a bit of Spring brightness to the 2014 Spring collection. Yellows and greens with stylish collared short and long sleeved tops and a wide range of printed t-shirts are complemented by denim, camouflage and relaxed jogger style trousers. There is the Soft Indigo range for the young boys based around denim tones. A wide variety of jeans and casual crew neck jumpers as well as trendy t-shirts. For the older boys there are the Grey Scale and Smart and Casuals ranges. With crew neck sweatshirts, coloured and skinny jeans and hooded tops in a palette of grey, yellow and navy. Simple t-shirts and shorts in the Holiday essentials range will have every boy ready for the warmer days coming later in the year. Occasion wear is also catered for in the Spring 2014 collection with a range of smart suits and party wear suitable for every special occasion. Your little man will be all set for bedtime too with the NEXT collection range of nightwear.